Pet photography can be challenging! Below are 10 tips to help you learn how to take stunning cat portraits of your furry family member with your smartphone, point & shoot camera, or DSLR. 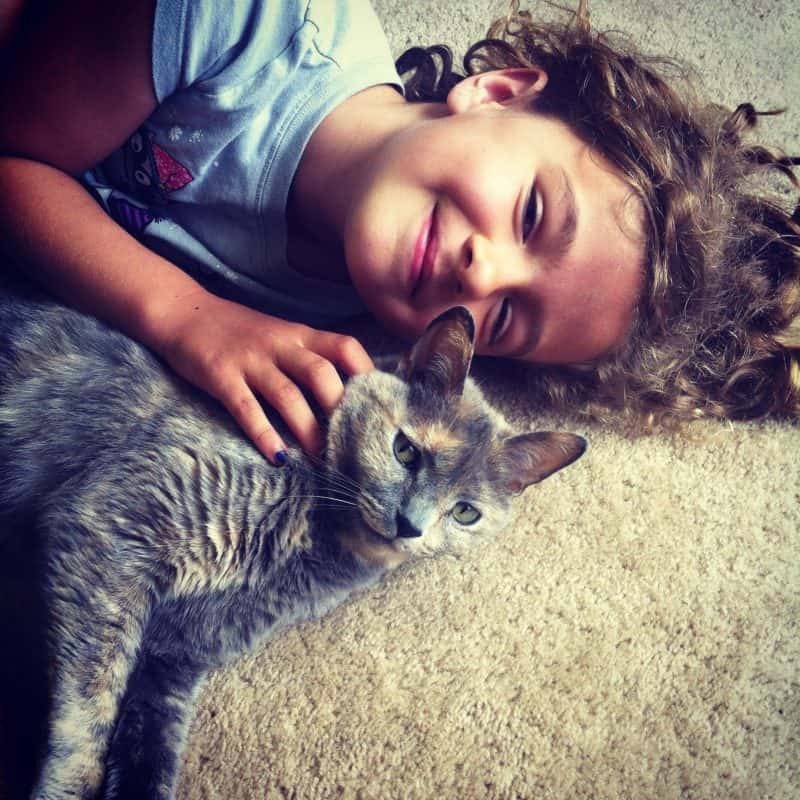 It’s this simple — You love them with all of your heart, making your cats precious loved ones to you . . . These furry, four-legged friends are alongside you during life’s little ups and downs. And they’re there for the BIG moments, too. Sometimes the best thing about your pets is simply that: They’re THERE. So, it’s important to document your feline as part of your family’s life. Learn how to take stunning cat portraits of your beloved kitty below! A quick note before we dive into the pet photography tips . . .
Did you know Meijer offers home delivery for pet supplies? You order cat food and supplies — along with your everyday groceries — using the shopmeijer app, and a personal shopper pulls together all your items. Your order conveniently arrives at your door in as little as 1 hour. Easy-peasy. This is SO HELPFUL for busy parents! Our family is big on presence and presents. Gift-giving is my personal “love language,” so I’m always on the lookout for creative ideas . . . Like using the shopmeijer app to send a care package to a new pet owner. Or having Meijer deliver a pet supply donation to a local animal shelter — Just shop and then let your loved one know you’ve made a donation in their name. Meijer gives you so many fun (and convenient) ways to surprise and delight others with gift giving! 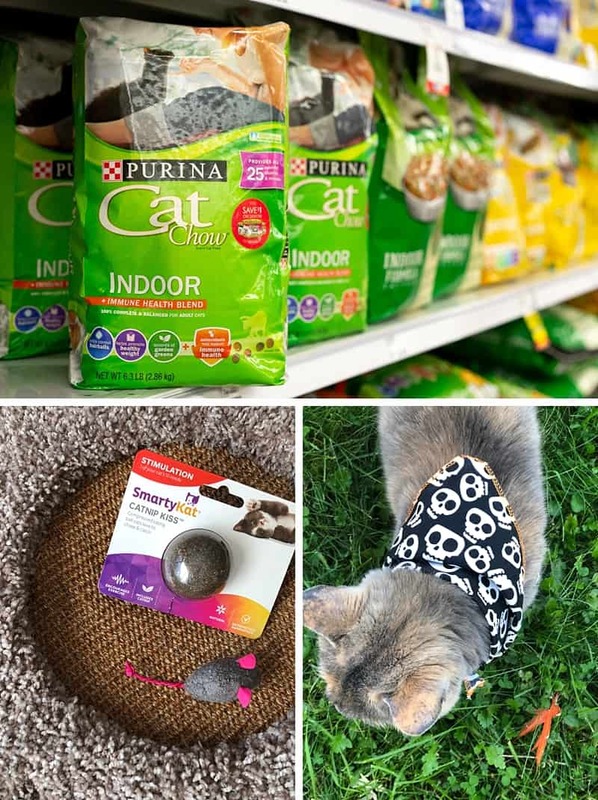 And if you want to spoil your little furball with a few gifts too, stop by this week (October 15-21) and enjoy BOGO 50% off Meijer Brand Cat Toys and 20% off Halloween costumes (like the adorable Skull Pet Bandana for Halloween my cat is rocking at the end of this post). A big thanks again to Meijer for sponsoring today’s Cat Chat. Getting Started Quick Tip: Be heavy-handed with treats during your pet photography sessions. 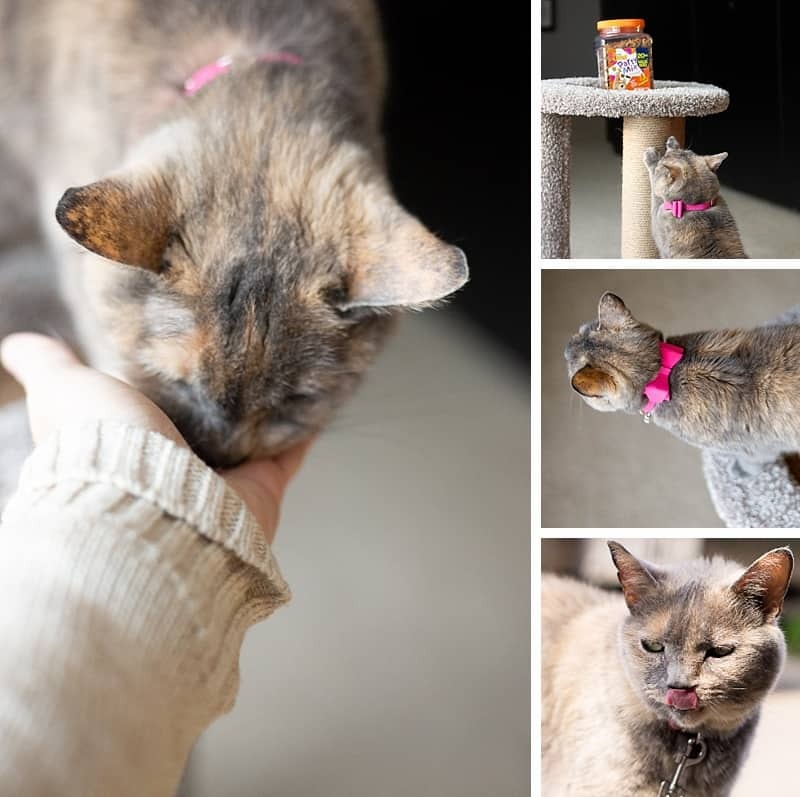 Before we get started, make a habit of giving your cat treats during photo sessions to ensure your kitty doesn’t get camera shy. This will keep your subject a happy camper! I’m pretty sure our cat has been conditioned to perk up with a positive response when she hears the click, click, click of my camera taking photos. Here are 10 tips that will help you drastically improve your pet photography using your smartphone, point & shoot camera, or DSLR. 1. In pet photography, practice makes perfect. 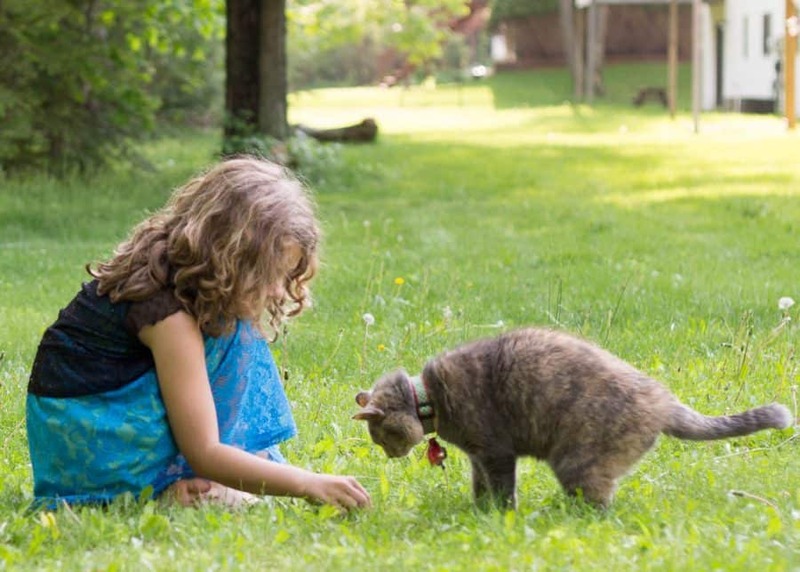 Take and review a couple of practice photos before you ever attempt to engage your cat. After quietly snapping a few shots, peek at your images and look for opportunities to improve your cat portrait (for example, lighting, backdrop, angle, zoom). You want to make the bulk of your “adjustments” BEFORE you try to coax your cat into looking your way. 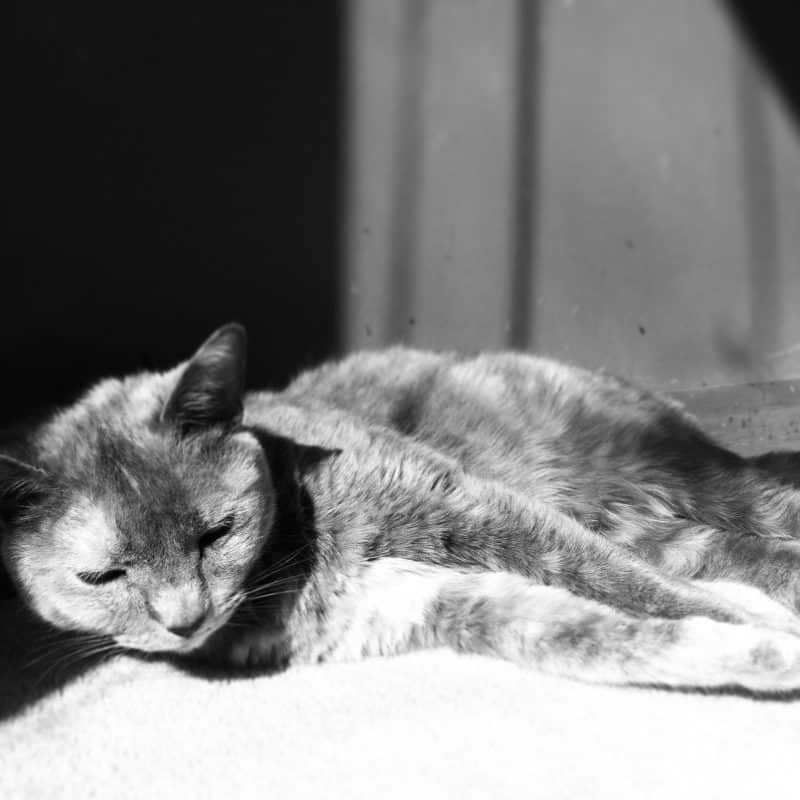 Here’s an example of a “practice shot” of our tortoise cat Pumpernickel. 2. 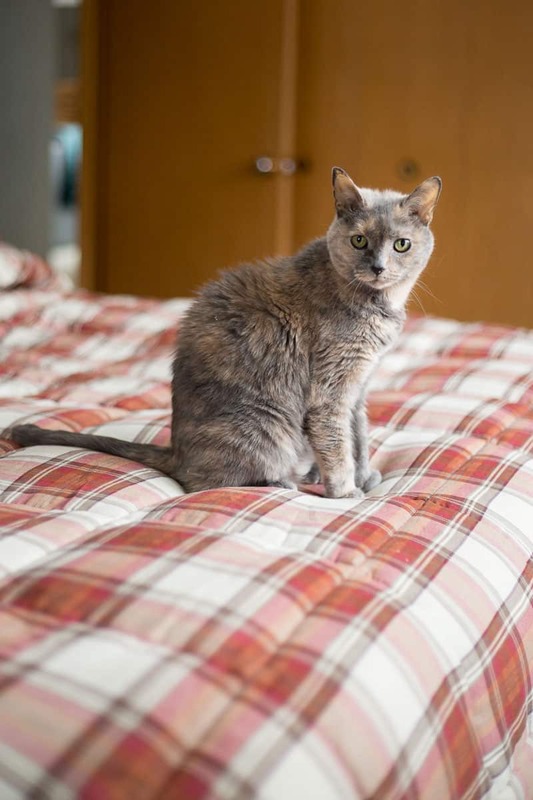 “Clear the clutter” when taking cat portraits. When reviewing your practice shots, look for excess background clutter that should be cleared from your cat portraits. You want your furball to be the focus of the photograph! There are a variety of ways to do this . . .
You can physically move around your subject looking for a cleaner angle. Something as simple as a shift in perspective can remove visual clutter and turn everyday pet photography into a lovely cat portrait. But sometimes there’s no amount of circling that will hide ACTUAL CLUTTER. If you find the backdrop colors and contrast you want to make your cat stand out, you might just have to roll up your sleeves for 2 minutes and tidy up that desk, floor, or bed — just the part in the camera’s view, anyway! 3. Capturing high-quality cat portraits is going to require you to act (or at least sound) like a fool. You’ve taken your practice shots, you’ve adjusted your camera settings or angle to ensure a clutter-free cat portrait, and now it’s time to get that million-dollar photo . . . 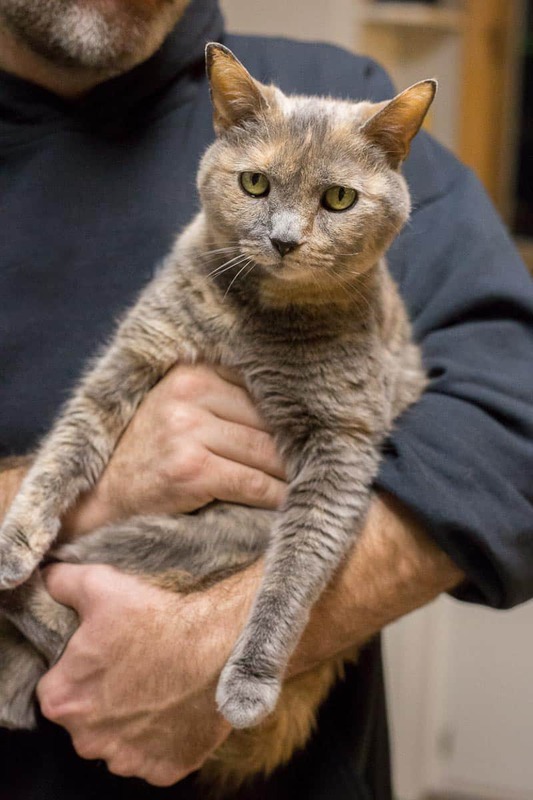 If you can get your cat to look directly at you when you snap the picture, it will create a strong sense of connection in the photograph. After all, it’s said that the eyes are the window to the soul. After adjusting my position and camera settings, and after making some ridiculously high-pitched bird calls, I was able to capture this adorable cat portrait when she glanced my way to see what the ruckus was all about. . .
4. When working on pet photography, use the Burst feature on your camera or smartphone. After you’re done shooting, review the whole set of slightly different images from your “Burst session” to find just the perfect one. 5. To ensure beautiful cat portraits, use light intentionally. If you’re trying to capture outdoor cat portraits, try to keep your kitty out of direct light and in a large area of open shade for the best results. 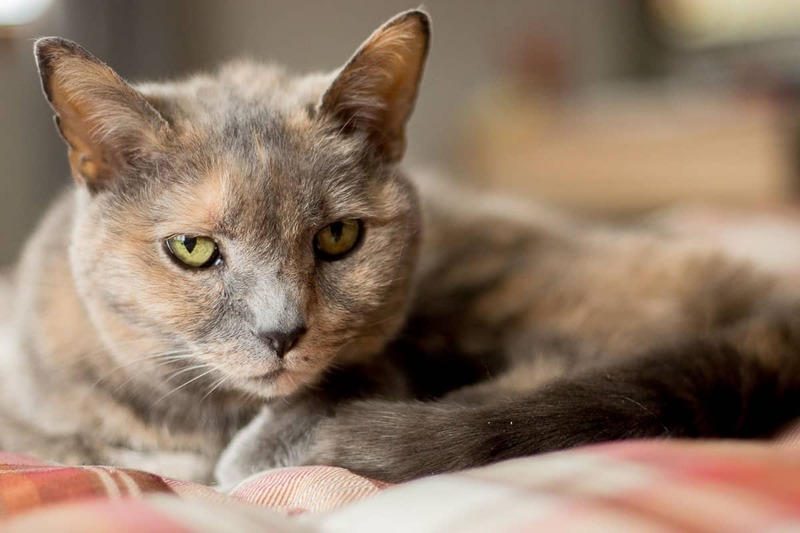 If you are inside, position your cat’s tower or bed near — but not directly in — a sunbeam coming in from a window to ensure soft, even light. PRO TIP: The best time of day to practice pet photography is during the “Golden Hour,” which is the period shortly after sunrise or before sunset. The daylight during these periods is softer than when the sun is higher in the sky and helps ensure great lighting for a cat portrait. Do that, and always skip the flash (so you don’t get red eyes from the light reflecting off your cat’s eyes back at you). 6. Fancify your feline for an adorable pet photography shoot. Experiment with colorful collars and handkerchiefs to add a dash of playfulness to your cat portraits. 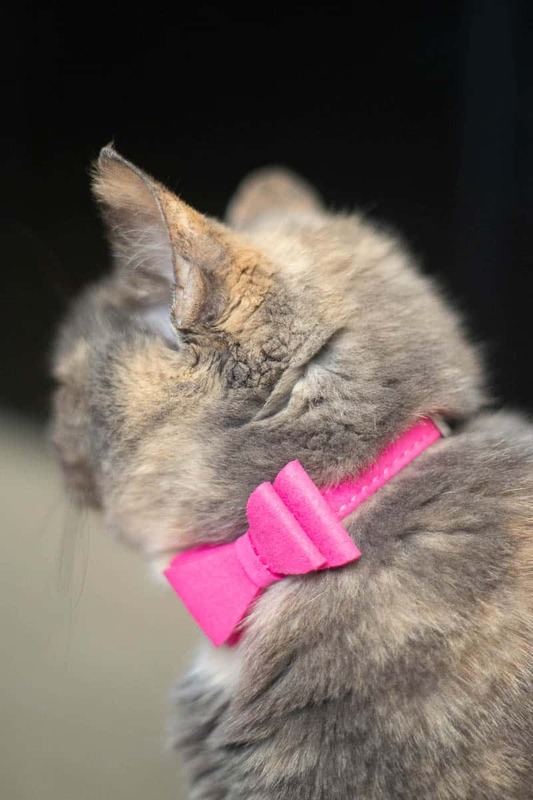 Featured cat must-haves available on Meijer.com: Adjustable cat collar with bow, Kitty Playground & Lounge Cat Scratcher, and Friskies Party Mix Cat Treats — All of which she LOVES. Well maybe, *I* love the collar, but who wouldn’t? I mean, how cute is this?!? Right now, our cat is sporting this Meijer Skull Pet Bandana for Halloween around the house. It cracks me up every time she comes over for a snuggle. 7. Make your furry baby the focus of the family photo. Don’t be afraid to artistically crop the people in your pet photography to ensure your cat is the focus. 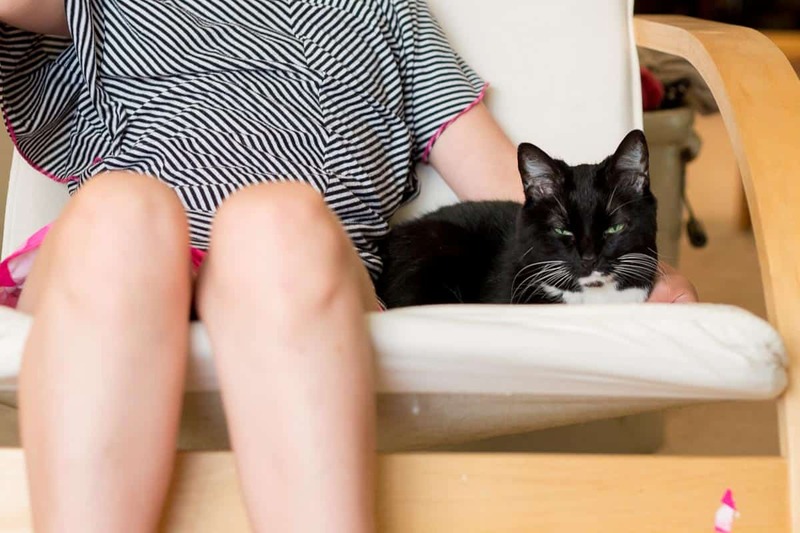 This spring, our tuxedo cat Mixy Lou passed away at 18 years old. We are so thankful to have family photos like this in our wall gallery. 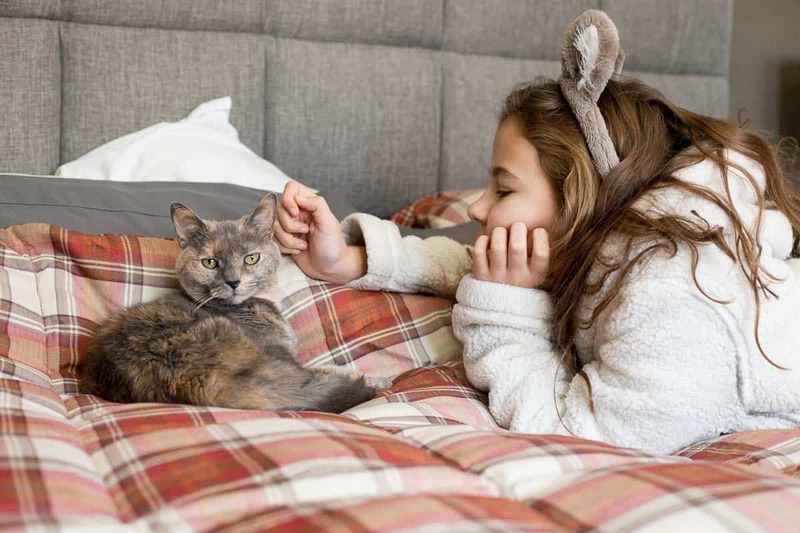 Don’t skip the day-to-day activities you do with your cat — playing with toys, cuddling on the couch, connecting during your nightly bedtime routine. 9. The best cat portraits are taken at eye level. Anytime you’re practicing pet photography, start by squatting and getting down to your cat’s level. The change in perspective will take your photo from a snapshot to something print-worthy. HINT: Your little feline friend makes an awesomely adorable subject at nap time (which is a substantial amount of the day around here). 10. Remember that the best camera for pet photography is the one you have within reach. That’s right — The best camera is always the one you have with you at the moment! 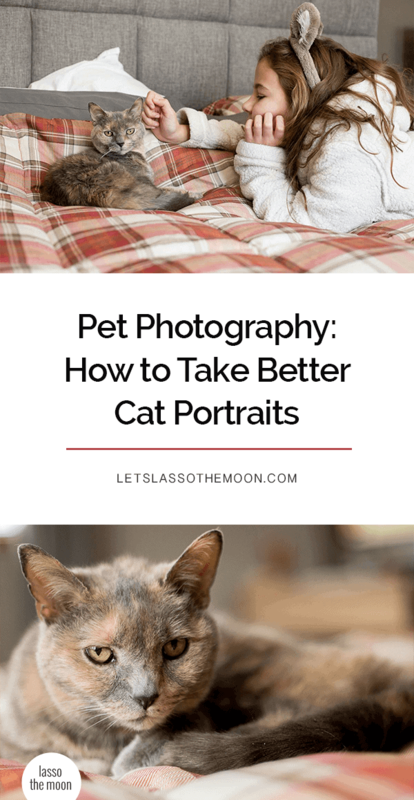 While I love practicing pet photography with my DSLR camera, some of my favorite cat portraits were taken with my smartphone (like the pics above and below!). These two adorable furballs have been a constant in our lives for over 15 years, and we’re so thankful they’re part of our family. When I pause to think of all the important moments our two cats have been part of — playing with ribbons as we planned our wedding, snuggling up during middle-of-the-night feedings for my girls, being lovingly stroked as we read bedtime stories together, serving as silent confidants after a hard day of middle school — it makes my heart smile to know we’ve got family photo keepsakes of these purr-fectly precious family members, too. So, what are you waiting for? Go get your click on TODAY! I’d love to see how your cat photos turn out — Tag me at @letslassothemoon on Instagram so I can see your adorable cat portraits!